This year, for our first session of Family Inventor’s Lab, we did an orientation to the class, tried a wide variety of hands-on STEM activities, and talked about Inventors. With a little more work, we got to the idea that an inventor is someone who creates something new that has never existed before, or is someone who takes someone else’s invention and makes it better in some way. We talked about why people invent. I said “Imagine I’m walking in the woods, and I see an apple tree, and I really want an apple… but [I stretch my arm up as high as I can] I just can’t reach one. What do I do?” One child suggested jump, so I mimed jumping as high as I can – still can’t reach it on my own. Another child suggested a ladder. I agreed that using a tool like a ladder would be a big help. Another suggested using a stick to knock it down, but then someone worried it would get bruised or might hit someone. Another suggested a cutter – he’d been apple picking and they’d used a special apple cutting tool mounted on a long stick. Read a biographical story about an inventor. Here are some to consider. Most of these are best for ages 5 – 7. If you have younger children, you may want to just use the pictures and paraphrase the story. Marvelous Mattie: How Margaret E. Knight Became an Inventor by McCully. Read more about the Marvelous Mattie book and a demo to do while reading it. Whoosh! : Lonnie Johnson’s Super-Soaking Stream of Inventions , a story about an African American inventor which starts with him as a boy excited by science and inventions. The Fantastic Undersea Life of Jacques Cousteau by Yaccarino. Starts with Jacques as a young boy who likes to tinker and then moves through the story of his inventions in a way that engages us in his motivation to keep pushing science forward in pursuit of his dreams. Balloons over Broadway: The True Story of the Puppeteer of Macy’s Parade by Sweet. Great story that starts with a child who “loved to figure out how to make things move….” He becomes a marionette, then does window displays for Macy’s and eventually invents the giant helium balloons that first appeared in the Macy’s Thanksgiving Day parade in 1928. Galimoto by Williams and Stock tells the story of a young boy in Malawi Africa, who wants to build a galimoto – a word that means car, but it’s also the name of push-toys made by children. The boy has a box with all of his worldly possessions – a ball of plastic bags tied with strings, a knife made from a tin can, and a puppet made from cornstalks. He has a few pieces of wire. Throughout the story, he scavenges, scrounges, and trades for other small bits and snippets of wire till he has enough to make a wire toy car to race with his friends. The Great Idea Series, includes books such as In the Bag! : Margaret Knight Wraps It Up and All Aboard! : Elijah McCoy’s Steam Engine by Kulling. Very nice biographies, that start with the inventor as a child, which helps students to relate to them, focus on one early invention, and then briefly address the inventor’s longer career. They’re pretty wordy. Best for 6 – 8 year olds. We then talk about the steps in the inventing process. First you come up with a problem that needs solved or a challenge you want to meet. (examples from the book read: such as making a guard so the shuttle can’t fly off the loom, making a better paper bag and/or examples from a project you will work on together in class). Then you brainstorm ideas for how to solve it. Like how Mattie drew ideas in her sketchbook. Then you start building. Sometimes you can’t tell if something will work until you actually start to work. Mattie built paper models and a wooden prototype. Then you test it – sometimes it works the first time, but usually you have to adjust it, test again, adjust and test again, till you get it just right. In this class, and our “What’s an Engineer” class, we use our Inventor’s Lab theme song we wrote which walks through the steps of the engineering or inventing process. You’ll find it in my post about Kids’ Songs about Inventing. Cause I am an inventor now. We do a lot of sorting activities. Sometimes the littlest kids just play with the items instead of sorting, and that’s OK too, as they’re learning and exploring. But, for the older kids, learning to observe, categorize and sort is a key skill for math and science thinking. Often it’s a simple binary sort – everything is either A or B. Sometimes we add in another layer for older kids, encouraging them to sort by multiple criteria: putting in order by size, or sorting the same objects by color and then by size. 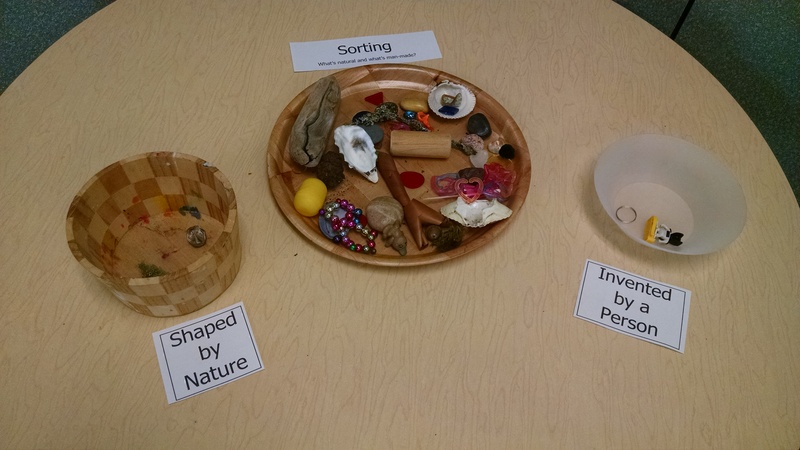 Today’s sort was natural vs. man-made (aka shaped by nature or invented by a person.) If you’re working with little ones, choose simple options: rubber ball, metal spoon, plastic toy, pine cone, rock and feather. For older kids choose some challenging items where the answer may be hard to discern – like our beach glass that looked like a weathered translucent scallop shell and the clear quartz that looked like glass. Robot Finger – A cardboard finger that bends. Robot finger tutorial. (We use this when we talk about animatronic dinosaurs in dinosaur week. Catapult: With craft sticks, rubber bands, and a few other supplies, you can build some great catapults to launch pompoms or marshmallows. Here’s a catapult tutorial. Boat: Create a boat factory with corks, Popsicle sticks, straws, paper, aluminum foil, clay, rubber bands, water-bottle bottoms, etc. Plus tape and glue. Challenge them to build a boat that can float. Learn more in our Sink and Float lesson plan. Musical Instruments. Challenge the kids to make an instrument. There’s lots of ideas in my post about Hearing. We read The Handiest Things in the World by Clements. 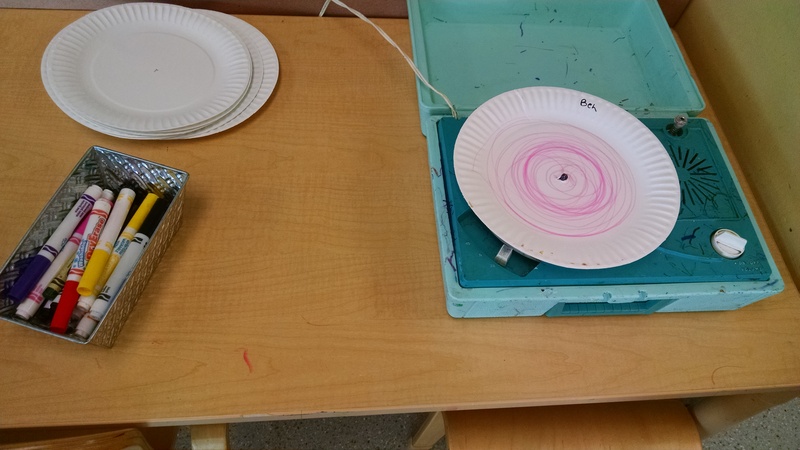 The idea for the companion activity came from Picture-Perfect STEM Lessons by Morgan. The book includes picture cards you can use, or you can make your own – each card has a picture of the inventions shown in the book, such as umbrellas, buckets, and combs. Then hand out a card to each child. When reading the book, only show them the left page at first that shows using your hands. Then ask them what invention would help someone accomplish the task that’s described… have the child with that card show it to everyone, then show them the picture in the book of that invention. We finish by reading The Most Magnificent Thing by Spires, which is a delightful story of a little girl who has in her head the image of the most magnificent invention. But she builds, and hammers, and tweaks and so on and she has lots of failed inventions. And she gets really mad. But then she goes for a walk, calms down, and gets back to work until she succeeds in making the most magnificent thing! There are also lots of other great imaginative story books about inventors to choose from. Check out my favorite Books about Inventors. Talk to your child about inventions – as you go through your days, talk about the tools you use (phone, computer, microwave, coffee maker and so on) and share what you know about how tasks were done before this invention and how this invention makes it easier. We’ve all seen lots of technological innovation during our lives – talk about some of your experiences with changing and improving technology. Encourage your child to invent…. when there’s a “problem” in your day, encourage them to brainstorm and test lots of ways to solve that problem. My son was having some challenges zipping his new backpack, so we figured out how to attach a metal ring to the zipper pull that’s easier to grab hold of. What challenges can your child solve this week? Note: All the activities described in my posts are from Family Inventor’s Lab, a parent-child cooperative class in Bellevue, WA. We are a play-based, STEM focused class for preschool through early elementary (kids age 3 – 7). We do a wide variety of fun, hands-on activities to learn about Science, Tools, Engineering, Nature, and Art. We also sing songs and read stories. Most of our activities are cheap, easy, and use everyday materials that most families would have in their homes (or their recycle bins! ), so that our activities are appropriate for classroom teachers, parents who homeschool, or after school programs.